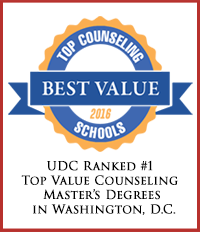 The counseling program offers the Master of Science Degree in Counseling with a concentration in School Counseling that is accredited by The Council for Accreditation of Counseling & Related Educational Programs (CACREP). The mission of the graduate program in school counseling is to provide a graduate education that will prepare students to meet the needs of a culturally diverse school community and increase the number of well-trained, competent counseling professionals that are able to serve students in grades k-12. At UDC, a shared multicultural perspective among students and faculty shapes the learning environment. Students are acutely aware of the diverse needs of students in k-12. To that end, they are committed to using the ASCA National Model to support student’s academic, career, and social/emotional development. Students and faculty also embrace the approach of healing the whole person, the family, and the community at large. The Counseling Unit, which embraces the core values of the institution, will fulfill its mission by providing students with an education that integrates theory and practice, by maintaining excellence in teaching, supporting faculty development, and ensuring that the curriculum reflects the changing needs of a highly technological and multiethnic society. The School Counseling Concentration is accredited by the Council for Accreditation of Counseling and Related Educational Programs (CACREP). It prepares students to become school counselors who will meet the certification requirements of the District of Columbia Public School System and adjacent states. Students entering the school counseling specialization are expected to complete field experience requirements for the elementary and secondary settings. Field placements for the school specialization are available during the Fall and Spring semesters only. Students must commit a minimum of 20 hours weekly on site to satisfy field experience requirements. Demonstrate knowledge and understanding of the professional role of a counselor and the diverse work environments. Demonstrate knowledge of the organization and administration of counseling in schools, as well as community-based agencies and organizations. Demonstrate familiarity with professional organizations and their ethical standards. Compare and contrast the role of counselors to other helping professionals. Demonstrate knowledge and understanding of the multicultural paradigm and the needs of a linguistically and ethnically diverse urban community such as the District of Columbia. Effectively engage systems to cause change that will embrace the authenticity of micro cultures in urban settings. Demonstrate knowledge of counseling models and the ability to use counseling skills that are effective when working with culturally diverse clients. Demonstrate knowledge of theories of development across the life span and integrate that knowledge in the application of counseling in schools and in agencies. Demonstrate knowledge and understanding of culturally relevant assessments of normalcy and pathology across domains. Demonstrate knowledge of career theories and career counseling models. Demonstrate ability to use assessment tools, the integration of technology and the career development resources. Demonstrate knowledge of laws that support and protect individuals with disabilities in the workplace. Develop a personal style of counseling through self-assessments, personal reflections, professional and personal growth activities, and application of theory into practice. Demonstrate effective counseling skills, cross-cultural counseling competencies, and the ability to work with diverse populations. Demonstrate understanding of the importance of self-care, life-long learning in maintaining knowledge of effective practices, continuous skill development, and affiliation with professional associations. Demonstrate the ability to provide direct services to clients in the specialized area of interest. Demonstrate knowledge of group work, types of groups, and theories of group counseling. Students will have experienced participating in a group and leading a group session. Demonstrate knowledge and understanding of appraisal techniques for counseling and have an understanding of measurement principles and statistical concepts. Demonstrate knowledge of various standardized and non-standardized assessment methods. Demonstrate the ability to select, administer and interpret tests and write assessment reports. Demonstrate the ability to conceptualize a research project, conduct a research study, and integrate technology into research practices. Students must complete the course research and evaluation within the first year of their program. Demonstrate competency in the utilization of technology i.e., computer-based assessments, Internet blackboard discussions, and on-line research of scholarly publications. Demonstrate knowledge of ethical concerns in research and principles of program evaluations. Identification of a specialization area and have in-depth knowledge in a specialized area of interest and population, including familiarity with professional organizations, ethical standards, and membership benefits. Demonstrate the professional knowledge and skills that promote the academic, career, and social development of all P–12 students. Demonstrate the ability to function as consultants to families, school personnel, and community agencies. Demonstrate familiarity with college readiness best practices. Demonstrate knowledge and understanding of school emergency management plans, crises, disasters, and trauma. Demonstrate the ability to identify risk factors and warning signs of students at risk for mental health and behavioral disorders. Demonstrate knowledge of common medications that affect learning, behavior, and mood in children and adolescents. Demonstrate the ability to identify signs and symptoms of substance abuse in children and adolescents, as well as the signs and symptoms of living in a home where substance use occurs. Demonstrate skills to critically examine the connections between social, familial, emotional, and behavior problems and academic achievement. Demonstrate the ability to use data to inform decision making. The School Counseling Program has been accredited by the Council for Accreditation of Counseling and Related Educational Programs (CACREP) since June 2010. In accordance with the requirements set forth by the Council for Higher Education Accreditation (CHEA), the program provides information to the public on its performance, including student graduation rates, accreditation status, and student achievement to provide public awareness. The graduate program in School Counseling is housed within the Division of Education, Health and Social Work. Student outcomes are evaluated every year using the District of Columbia, Office of the State Superintendent of Education (OSSE) approved academic assessment, the Professional School Counselor Praxis, and the successful acquisition of employment three to six months following graduation. The clinical mental health concentration is designed to prepare students for state licensure as a licensed professional counselor and as a national certified counselor. Students who complete the clinical mental health counseling concentration are competitive applicants for careers in community agencies and government entities, and can pursue state licensure as mental health practitioners. Students must complete field experiences related to the specialization. Students are expected to complete field experience requirements in settings that provide opportunities to deliver clinical mental health services. Field placements are available during the summer session with the approval of the advisor, and students must commit a minimum of 20 hours weekly on site to satisfy field experience requirements. Students interested in professional licensure or clinical certification should obtain copies of the licensure and certification standards from the appropriate state licensure board or the appropriate professional association. Graduate-level coursework in counseling includes theoretical and applied training in several course areas: philosophy and practice, life span development, career theories, and development, appraisal, social and cultural foundations, research and evaluation, counseling techniques and ethical/legal/professional issues. In addition, students are required to complete 9 credit hours of supervised clinical experience in counseling. Graduates of the program are employed in schools, educational, judicial, mental health and drug treatment facilities, as well as in government and corporate settings throughout the Washington, D.C. metropolitan area. Many graduates have successfully passed state license board exams and certification exams, or have entered advanced training programs. Many have completed doctoral programs. The Master of Science degree in Counseling includes a curriculum of 60 semester hours for the school counseling concentration and 60 semester hours for the clinical mental health counseling. The degree requirements also include a thesis option (6 credits) or a thesis project option (3 credits). The Graduate Counseling Club organizes activities designed to enhance the professional identity of students as professional counselors, including Licensure Professional Counselors (LCP) post-graduate exam preparation, career planning and leadership opportunities. Chi Sigma Iota is an international honor society for qualified graduate students, professional counselors and counselor educators that promotes scholarship, research, professionalism, leadership, advocacy and excellence in counseling. Students are encouraged to become student members of the American Counseling Association (ACA) and the American School Counselor Association (ASCA). Membership in ACA and ASCA offers professional development and leadership opportunities as a professional counselor. With faculty support and mentorship, you may seek internships at area schools and treatment facilities or pursue research projects.